Afgelopen week heb Ik heel wat leuke tutorials bekeken op YouTube. In één van de filmpjes ontving ik de tip om op ansichtkaart formaat papier te experimenteren. Dit kan met verf, inkt, stempels, pen, krijt, potloden… of combinaties hiervan. Op de achterkant van het kaartje schrijf je de gebruikte producten en het recept van het experiment op. Zo creëer als het ware je eigen recepten boek of bak en ontwikkel je steeds meer product- en techniek kennis. Ben je benieuwd naar de artjournal mogelijkheden van deze kaartjes? Ik laat binnenkort zien wat ik ervan gebakken heb. Fijn weekend en succes met experimenteren! So… this weekend I started to experiment. Ecoline, acrylic paint and water-soluble chalk, they were all on my list to try out on the A6 format cards. Unfortunately, I did not get the desired aha-moment with the gasping for breath and a sense of euphoria stuff while looking for a pen that I can never find when I need it. All the cards were fairly predictable and not such that I want to make a recipe card from it. Less than 3 months ago I would have send the tickets directly to the bin. But I don’t do that anymore! Since I started a Roben-Marie Smith course, I know that paper is the new gold and I have learned to keep everything. No snippet get lost anymore! Everything is neatly stored in trays and boxes and properly reused. And you know what: I LOVE IT! I’m verry proud to show you my stock on the image above. 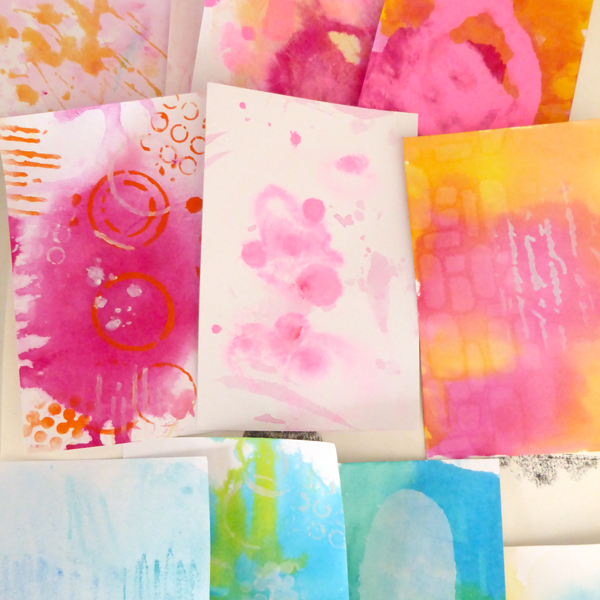 Are you curious about the artjournal possibilities of these cards? I will soon show what I have made out of it. Have a great weekend and good luck with experimenting!